Thinking of something for that motorcycle speed junkie in your life for Christmas? John Stein’s self-published, hardcover book, Motorcycle Drag Racing: A History hit the book stores in 2011. 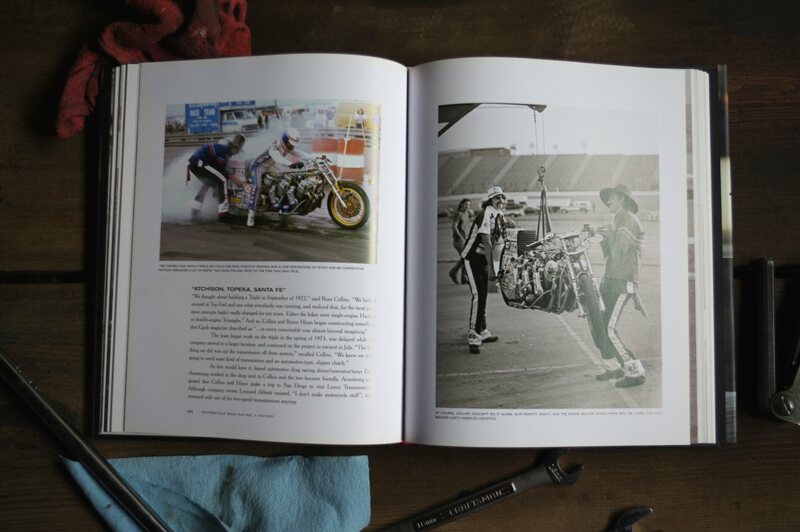 This enormous coffee table book covers the full range of motorcycle drag racing history from the earliest days to the modern era. Because this publication is a coffee-table-book, it is by nature, it’s a pictorial book. 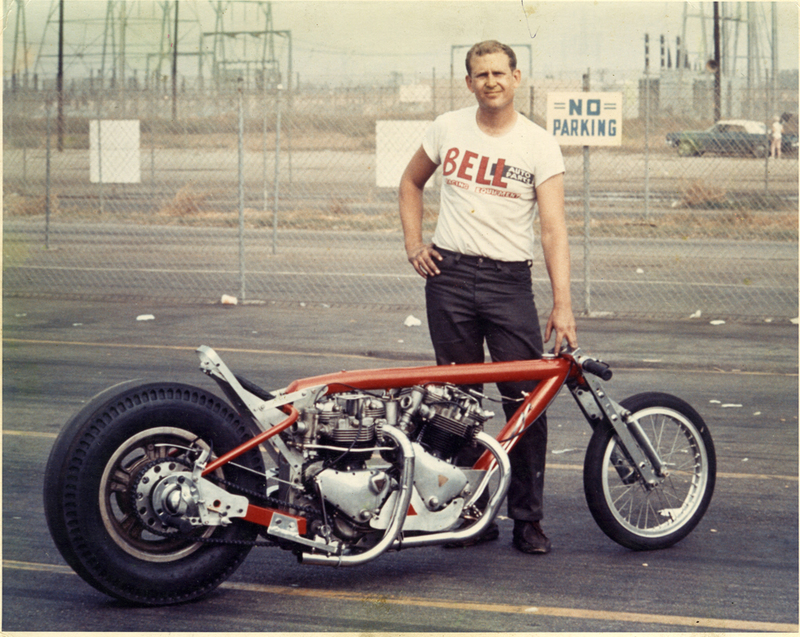 It’s heft and overall size lends it to many, many, historical photographs of drag bikes, images taken over a five decade span of time. 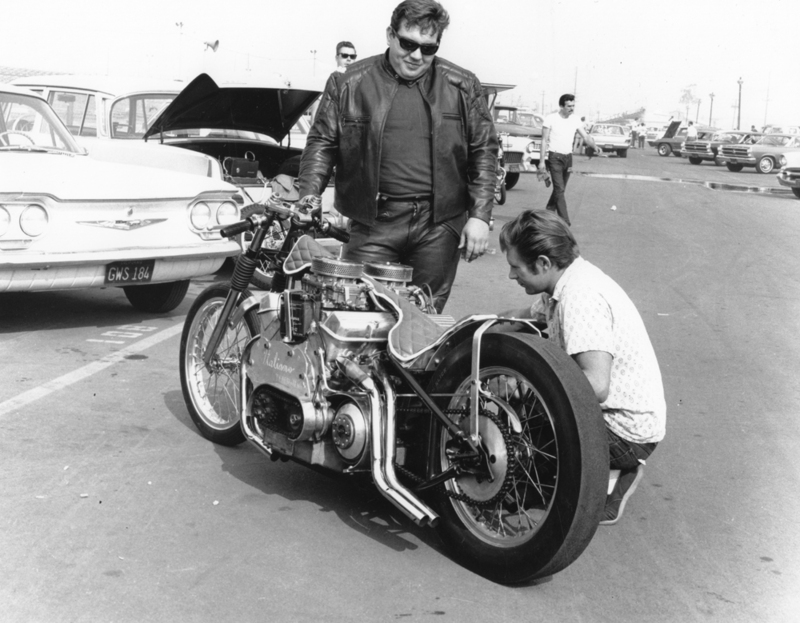 From drag bike racing’s earliest roots in southern California during the nineteen-fifties, to images captured during the new millennium, the man and the machines are presented for readers enjoyment. 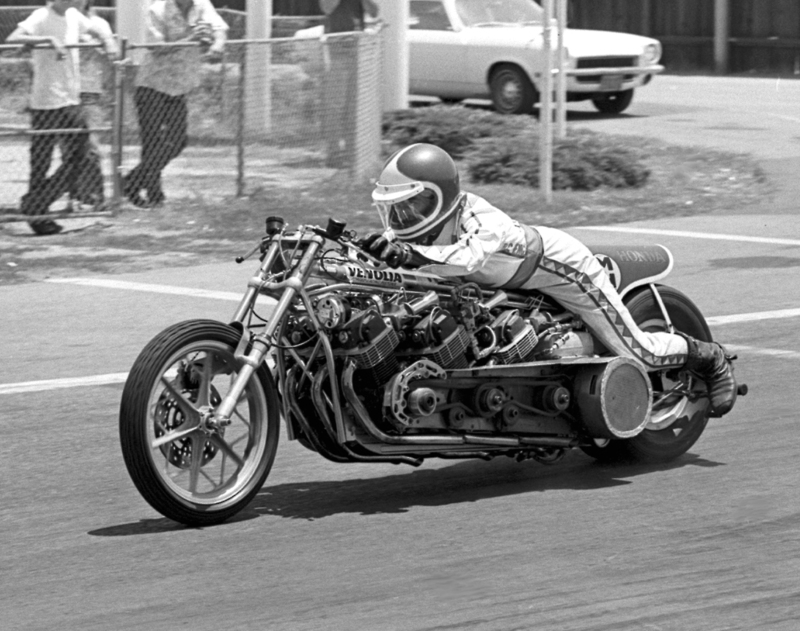 For new comers to the sport of motorcycle drag racing this is a fun read. Whereas most motorcycle magazines today have zero coverage of motorcycle drag racing, few entrants to the sport will have any inkling as to “Who’s Who” in the world or drag bike racing, let alone have any knowledge of where the sport has evolved from. Stein’s book helps address this void. This is a very large hard cover pictorial jam packed with dozens of photographs in black & white, as well as in color, that give readers a great look at some very historical drag racing figures. 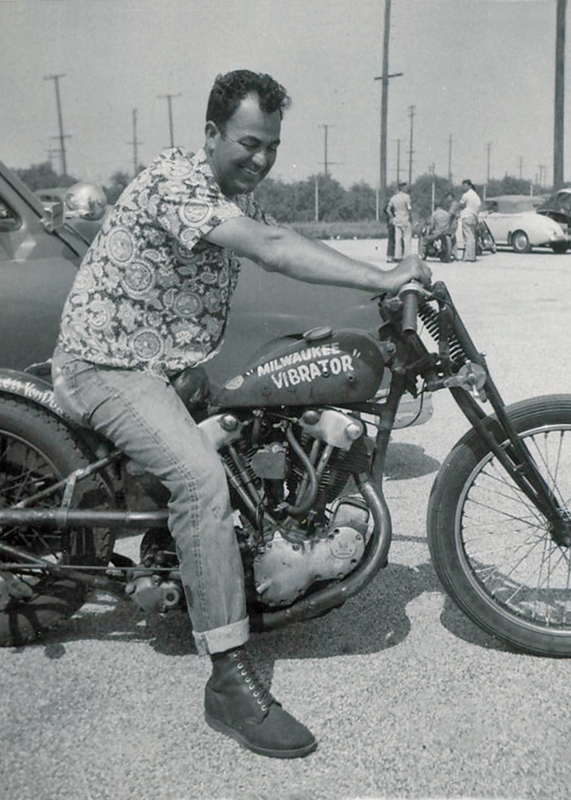 Elmer Trett, Vance & Hines, Marion Owens, Joe Smith, Rick Stetson, George Bryce, if you name the racer or bike, you can most often find the combination somewhere in Stein’s publication. Because John’s book addresses close to five decades of drag racing, understandably there are gaps in details. And while I’ve heard more than one drag racing veteran mumble openly about this or that not being in the book, one must understand that a single publication can’t possibly cover all fifty years and hit every detail. It would, and will, take a full motorcycle drag racing museum to do that. You’ll see that one day, but not today, and no single publication can get all covered in one shot. Mr. Stein’s book is the first honest effort in a hardcover publication at chronicling the story of the sport that refuses to grow up. If motorcycle drag racing had solid racing sanctions with well recorded historical archives to reference, Mr. Stine’s job would have been exponentially easier. As is the case, old magazines are the primary historical archive historians of the sport have to work with and I’ll point out that even the old magazine stories are a bit sketchy, so historical accuracy is sometimes near impossible. Memories of the racers fade, so to does the print of the old news papers. John Stein – Motorcycle Drag Racing: A History, 244 pages is available through Schnitz Racing, Gearhead Publishing, or through Amazon.com for about $45. All in all, John’s book is a great purchase for anyone who has a motorcycle “Go Fast” person in their life. Male or female, if you know someone who’s a speed demon on two wheels, buy them this book as a gift and watch them smile as they flip pages for hours. I bought this greattt book from the MTC product rep. a last weekends man. cup finals in Bradenton FL. .A great 3 day race a verrry informative book. $ 80.00 American dollars. 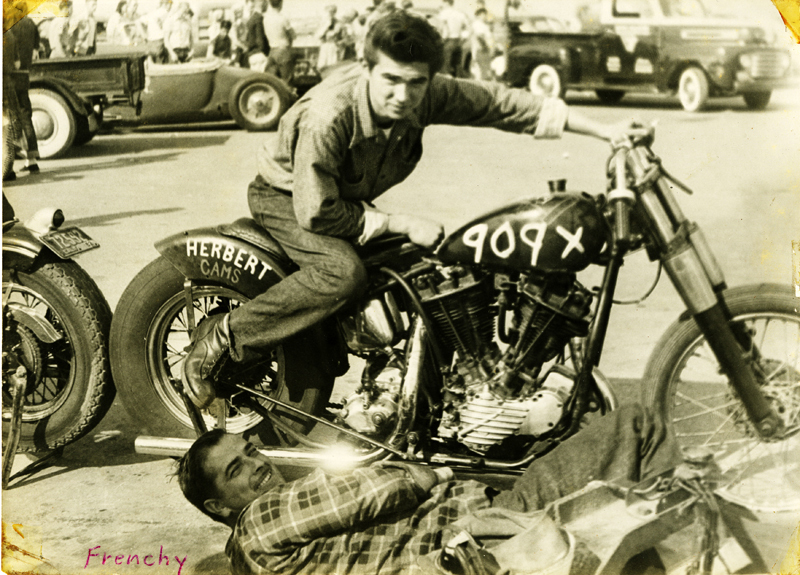 Now its long term and short term memories of drag racing motorcycle style. for the best damned book this guy has ever had time to read.